This is CRAZY! Prepare yourself. The official cast art poster for "American Horror Story: Freak Show" is here, and it gives us our first look at the actors in their freaky costumes. 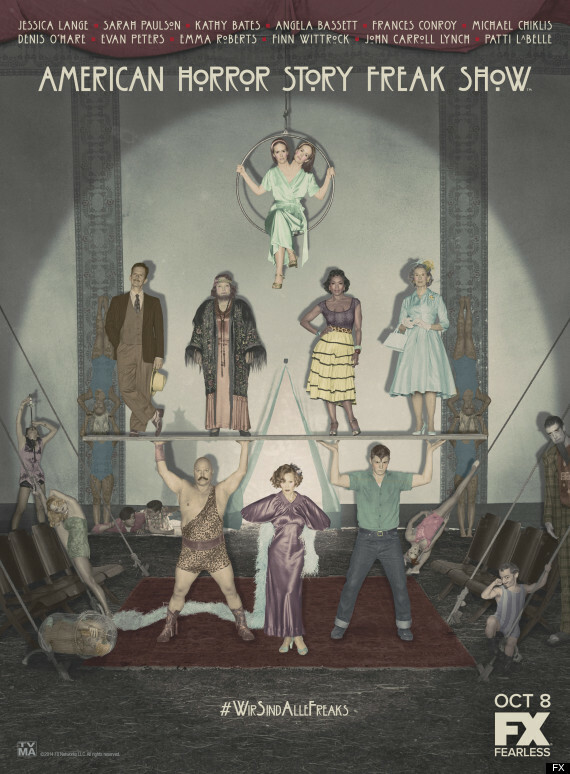 Kathy Bates is the bearded lady, Effel Darling, her ex-husband is Michael Chiklis as the strong man, Angela Bassett is Desiree Dupree, who from the looks of the poster has three breasts (although FX would not confirm), and Jessica Lange's Elsa Mars is in the center reigning supreme (no pun intended) over her cast of freaks. Evan Peters appears on the bottom right as Jimmy Darling, son of Effel and Chiklis' character, oh, and the poster also offers an amazing first front-view look at Sarah Paulson's two heads, Bette and Dot. What's that you say? You're still not excited and creeped out? No worries, there's also a brand new teaser to give you another taste of the craziness that's to come. It shows someone/thing trapped in a birdcage -- that caged creature is also included in the cast art poster on the bottom left. On top of the three-legged woman, split-tongued man and creepy hand, we're beyond thrilled for what's been brewing in Ryan Murphy's imagination. Check out the latest teaser below and join us in analyzing the poster to try to figure out who the rest of the characters could be. "American Horror Story: Freak Show" premieres on Oct. 8 on FX.